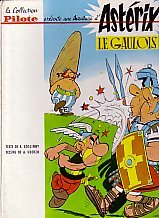 www.asterix.com , the official site, by Éditions AlbertRené, French and four other languages. Stéphane Rivière's French Astérix pages, with notes. The original. Text by Ren&ecute; Goscinny, illustrations by Albert Uderzo. Text and illustrations by Albert Uderzo. Book by Jean-Yves Ferri and Didier Conrad.